New England vegetation consists of hardwood forests that also contain White Pine and Hemlock. 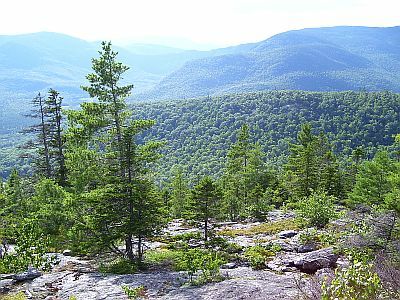 Spruce and Fir forests are found in the north and in the mountains. The natural vegetation of some coastal areas consists of pine barrens, containing Pitch Pine. However, these habitats have become very rare in recent years. 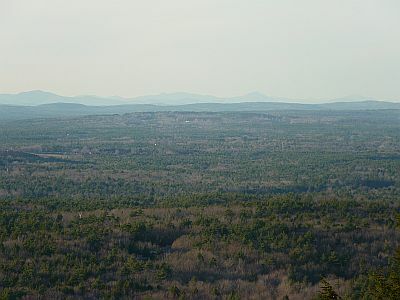 From Mount Agamenticus, a small mountain in southern Maine, it is possible to get a wide panoramic sight of the landscape. On one side the view opens to the Atlantic Ocean, with coastal towns and secondary forests dominated by White Pine. In the other direction, on a clear day, one can see the caps of the White Mountains, where snow remains well into late spring. 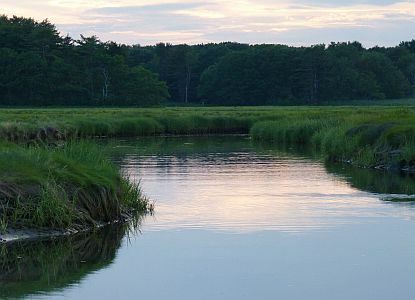 Tidal wetlands reach far inland along river arms and provide an interesting habitat where salt marshes and coastal hardwood forests meet. 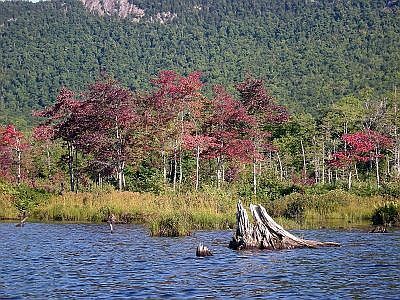 Such wetlands contain a rich variety of species including oaks, maples, beech, ash, hickory and other deciduous trees as well as white pine, hemlock, spruce and red cedar (Juniper). Old stone walls bear witness to a time when much of New England was farmed land. In the 1800s, many farm families left New England, tired of the shallow and rocky soils, to settle the more fertile Midwest. As the land was abandoned, new forests took over, consisting initially of Birch and White Pine, but later of hardwoods as well, especially Red Oak. The landscape is rich in lakes and streams, which provide unique habitats to the many creatures that call them home. Pin Oak (Quercus palustris) and Red Maple (Acer rubrum) are common species in moist or wet locations. Highbush blueberry is one of the most common shrubs along New England lake shores. All turn a beautiful scarlet red in fall. All over the landscape one can find small ponds which in many cases dry out during the summer. These vernal pools are important breeding grounds for amphibians and host a rich variety of plants. Beech forests turn a pleasing yellow in the fall. Paper mills were typical features in the vast forested areas of New England for many years. Yet many have closed down recently. This one in Berlin, NH was dismantled a few years ago. The mountains can be tough on plants, but they provide fresh clean water and allow for a cooling dive into creeks and whirlpools. 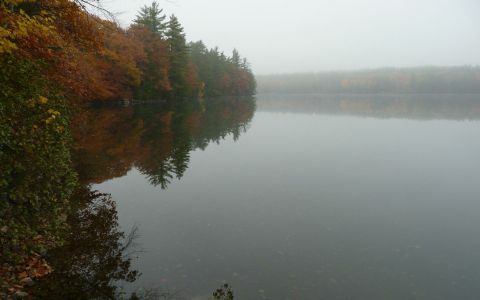 Large stretches of land in New Hampshire and western Maine are protected. They make up the White Mountains National Forest. Spruce and fir dominate the mountain regions up to the tree line, where plants are stunted from the harsh conditions and form the Krummholz.